The last group in my class Working in Virtual Worlds will present their final project in Second Life tomorrow Tuesday, May 5 2009. This group picked a unique project, they wanted to explore a Second Life culture so they decided to join the Saints of Hell. 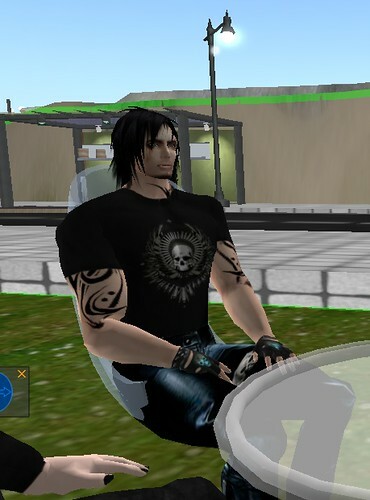 The Saints of Hell are a 1% Outlaw Motorcycle role-play group in Second Life. The students have told me that the Saints are set up like a traditional 1% Motorcycle Club where they have a President, Vice President and Sgt at Arms. The students have been spending up to 10 hours a week immersed in the role-play for five weeks. During the last few weeks I’ve observed several changes during their role-play experience. The most obvious is their avatar appearance. When they first mentioned their project as an initial task I asked them to give their avatars a biker make-over. As you can see from the picture below, they went a little over board on the fantasy end. 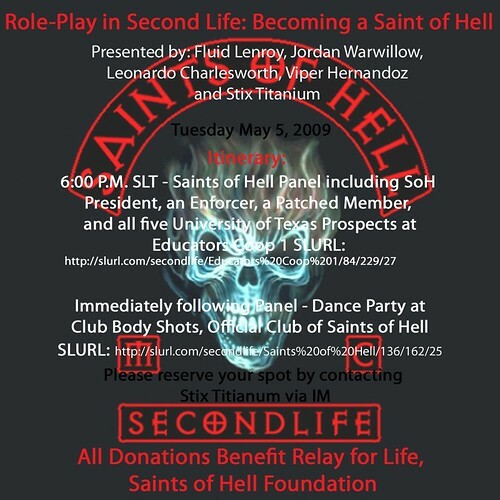 If you have a chance, drop by and learn more about the Saints of Hell and role-play in Second Life.